We receive a ton of emails and comments on our YouTube Videos asking which cooler we personally take camping. Although we do have a favorite cooler, it’s for reasons that most would find irrelevant. [See Our Video Embedded Below] Long story short, we choose the Engel 50qt, because its the perfect size for 3-4 days camping for two people. But more importantly it fits perfectly between the ribs of our tonneau cover in the bed of our truck. So, as you can see picking a camping cooler can get a bit unique. Therefore we will broadly cover the most popular sizes and models. Whether you are going on an overnight adventure or a week-long expedition, when you are looking at the best coolers for camping, you’ll want to find one that will withstand the outdoors .This include wildlife, most notably bears! The best coolers for camping are weatherproof, waterproof, bear proof as well as being able to keep your food cold for long periods of time. What Makes a Cooler the Best For Camping? These coolers are not just for camping they can be for many other uses. What makes a camping cooler a camping cooler are a few factors seen below, most notably if it is Certified Bear Resistant. If you are only camping for a short-time, such as the weekend, then a smaller cooler will be more practical. However, just because it is on the smaller side, it should still be strong enough to withstand any adverse weather and critters. Additionally, you want to look for a one that is portable. If you are camping by yourself, you’ll need to be able to move it around easily. A small camping cooler (25 quarts) is ideal if you are going on a camping trip by yourself for one or two days. 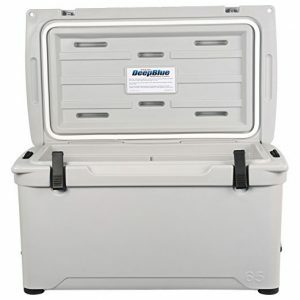 A medium camping cooler (25-45 quarts) is ideal if you are going on a camping trip by yourself for three to four days. This size will work for one or two people. A large camping cooler (45-70 quarts) is ideal if for a weeklong camping trip. It will also work for a family going on a weekend camping trip. Our Tips: One of the most popular questions we receive in regards to camping coolers is “how big of a cooler do I need.” This is a question only you can answer, as it depends largely on how much you need to bring with, for how long, external temperatures, and a bunch of other factors. However, the one tip we do like to provide is… if you even think you may need more size, then go with the bigger cooler. For example many people write in asking if they should buy a 40qt cooler vs 50 qt cooler. The size difference, albeit not huge, can make a big difference, especially if you even think you might need. Those who are heading off the grid for a camping trip will be definitely be concerned with ice retention times. Ice retention is merely the length of time a cooler can maintain ice. This is a tricky topic to tackle, as not only does cooler size greatly impact how long a cooler can keep ice, but so does a bunch of other factors. Our Tips: After conducting well over 50 different cooler challenges, we narrowed down the most important factors which will prolong the life of your ice. Cooler size (assuming the cooler is filled to capacity with ice) is the single greatest factor to influence ice retention times. We have to really emphasis the filled to capacity aspect. Filling a cooled to capacity with just ice is not practical, as those going camping need to bring along beverages, food, etc. However, what you can do is to make sure the cooler is maxed out with chilled contents as well as much ice as possible. Ice packs will also add to the lifespan of your ice, but they should be used in conjunction with physical ice for maximum ice retention. Although coolers are seemingly simple devices, the rise of so many new cooler manufactures, has forced them to add even more features to stand out from the crowd. Be it an integrated ruler on the lid, wire basket, dividing boards, cutting boards, wheels, there is no end to “extras” a cooler can offer. One of the most practical cooler feature for camping coolers is the presence of wheels. The chances are, if you are going camping, you’ll likely be going with a loaded cooler. Roto molded coolers that are filled to the max with soda, beer, meat, and ice can get extremely heavy. Having wheels will make moving the cooler around the campsite or from the truck to the tent a heck of a lot easier. Our Tips: If you do decide on a cooler with wheels, be very cognizant of the type of wheels on your cooler. Some coolers like a Nash or Kysek for example have smaller “roller blade style” wheels which will not be suitable for conquering rocks, dirt, mud etc which will more than likely be at a campsite. Rather a cooler like the Pelican (reviewed below) which has much larger wheels which is much more apt to conquering campground terrain. A camping cooler that costs a little more might seem expensive, but if you plan on going camping for more than say 10- 20 days out of the year, it will be an investment and well worth the price.The most important point to remember is that in remote environment, food smells attract animals and critters, in particular, bears. What are Bear Proof Coolers? 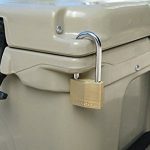 NOTE: One of the biggest misconceptions with “bear proof coolers” is the belief that latches alone will prevent a bear or other animals from gaining access to your cooler. Although some models might provide this, the only way to be certain it to lock your cooler shut. Bear proof coolers, also known as grizzly proof coolers, are coolers that are not only strong enough for wilderness camping trips, but also will protect your food from bears and other animals. Bear proof coolers will keep your perishables safe, and furthermore, will not harm any animals that attempt to consume the coolers (or the contents in the cooler). When animals break into a cooler and eat what’s inside, it could possibly harm or kill them and worse yet create a safety hazard for other campers. For this reason, the best bear proof coolers are certified by the Interagency Grizzly Bear Committee (IGBC), an organization that works to preserve the grizzly bear population. IGBC certified coolers have been rigorously tested to make sure that your food and drinks are kept safe, and in the event that animals break into your cooler, then they will not be harmed as well. 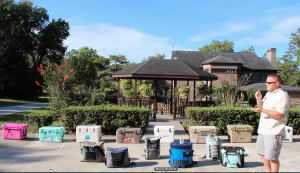 If you are considering purchasing a bear proof cooler, below is information on three of the best bear proof coolers on the market. 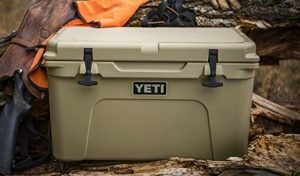 A lot of our readers may be pondering between a Grizzly Cooler vs Yeti, Pelican Vs Yeti OR a Engel vs Yeti all of which have their own reviews. 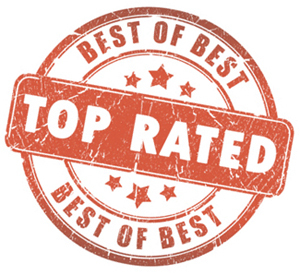 Below is only a brief review of our top picks, you can see the full reviews for even more information. As we’ve already mentioned, this is our go-to cooler when we go camping. This cooler works for us because it’s a tall/deeper cooler as opposed to a wider cooler. For those with a lot of gear, like us, it takes up less real estate in the back of a truck or SUV. The Engel 50 qt. 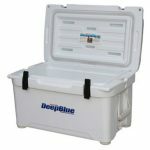 DeepBlue Performance Cooler has a two inch wall of insulation that allows campers to keep ice for 8-10 days. We actually were able to get 10 FULL Days out of our Engel [See Video Below] One unique feature that the Engel has that the Grizzly 400 and the Yeti 45 doesn’t, is a pitched floor that allows water to drain completely; which means you will not be straining yourself with unnecessary lifting to empty ice melt. Like the Yeti 45 and the Grizzly, the Engel 50 is IGBC certified. Additionally, the Engel 50qt. comes with non-skid feet and rope handles, like the other two below. Another unique feature to this cooler is the latch system. The Engel uses a compression latch as opposed to a T-Latches on most other roto molded coolers. 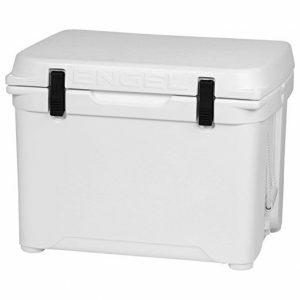 Lastly, and one of the most important aspects of Engel coolers is the affordability. This is one of the best bang for your bucks. 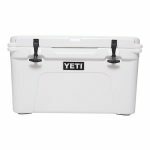 Well known to camping aficionados for it durable camping products, Yeti provides a cooler line (the Tundra Series) that will stand the test of any rugged outdoor trip. 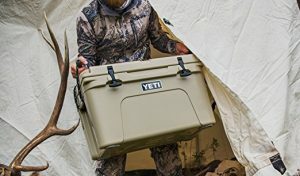 The Yeti Tundra 45 Cooler hosts a number of necessary features for a better prepared camping trip, including a dry goods rack, rope handles for easy handling, and non-slip rubber feet. 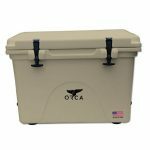 This cooler has long been the favorite among those that take their camping and four wheeling seriously. 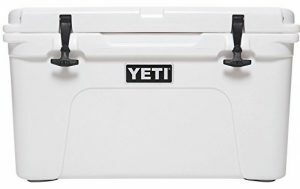 It is made with roto-molded polyethylene, UV resistance, and sturdy insolation, which makes the Yeti Tundra 45 Cooler practically impossible to destroy, meaning, it is IGBC certified. The huge capacity of the Yeti Tundra 45 Cooler can hold up to 26 cans of beverages or 35 pounds of ice. This will only be a reasonable choice for a select few as this is one of the BIGGEST camping coolers available. However, we felt obliged to include it as we do occasionally hear from those who will be going on a week-long elk, deer or moose hunts. 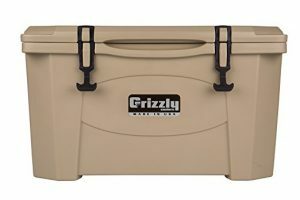 If you are planning a long camping trip, the Grizzly 400 by Grizzly Coolers is one of your best coolers for camping. It is constructed to carry everything you need for your camping excursion to your campsite and back. 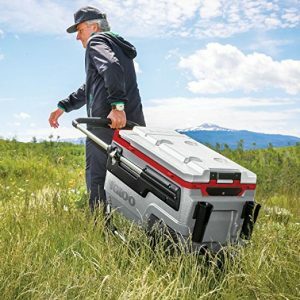 Similar to the Yeti 45 Cooler, the Grizzly 400 holds bear resistant certification by the IGBC. It has an unique latch system that makes it difficult for animals to break, especially when there is the added protection of two shackle padlocks. 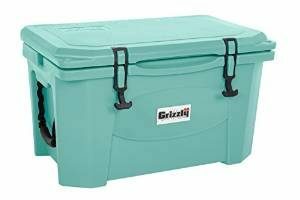 While the Yeti 45 Cooler is geared towards camping trips that will last one or two days, the Grizzly 400 Cooler is geared toward longer camping trips, in particular, family camping trips. It will hold 500-12oz. cans or 200-20 oz. bottles. 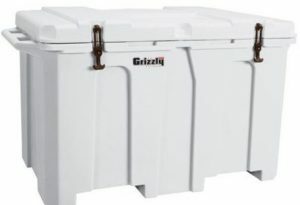 It is important to take into consideration that the Grizzly 400 Cooler is huge and heavy, weighing in at 90 lbs., while the Yeti 45 Cooler is only 22 lbs. If you are going camping by yourself, you have to ask yourself if you want to be lugging around a 90 lbs. cooler. 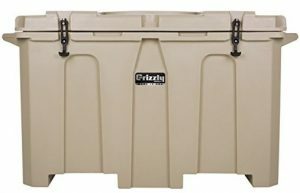 Another question to consider about the Grizzly 400 Cooler is the price. While the Engle 50 qt. DeepBlue and the Yeti 45 are roughly around the same price, the Grizzly 400 is about three times the cost of either of them. For those going on smaller camping excursions, the Grizzly 40Qt is a solid choice. Many of those who are campers will appreciate the fact that this cooler is Made In USA. This cooler comes with an integrated ruler on the lid, making it suitable not only for camping but also for fishing. We can vouch for the build quality and this makes for the perfect seat around a campfire. In our testing, this cooler handled 5 Days of ice retention. Filling the cooler as much as possible with ice and opening the cooler as infrequent as possible will help significantly increase the life of your ice. Lastly, this is one of the most affordable roto molded coolers, making it the perfect choice for budget conscious campers. As seen in the video above, the new style Pelican gives the Engel 50qt a run for its money in terms of ice retention times. 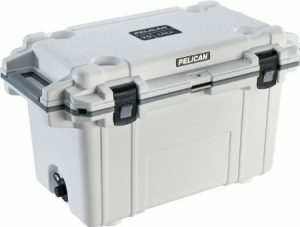 This cooler can last 10 Full Days as advertised by Pelican. External temperatures in addition to how often the cooler is opened and closed will definitely effect ice retention times. This is a larger (or bulkier is a better word) cooler compared to Grizzly to Engel, but does offer our favorite style latches. All Pelican coolers use a Press & Push latch. One of the most admirable features of Pelican coolers is the Limited Lifetime Warranty offered. Normally this would be our pick for the best camping cooler as it was [until recently] the cooler to beat. Test after test, the Orca came out on top. If you are looking for a cooler that can hold ice ridiculously long, Orca is one of the best picks. Orca coolers are also Made In USA and offer a superior warranty. Our only issues with this cooler was the size. It would not fit under our truck tonneau cover. Of course, this is a limited concern to only those who are restricted by height requirements. However, it is worth noting that this a larger and beefier cooler than most. Then again, this is probably why the Orca can hold ice so well. The Orca can also be quite pricey compared to the other coolers outlined above. 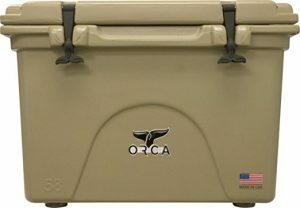 Orca coolers come in a variety of coolers. Check the link below for all color and size choices.